Wheel mounted Nitrogen tire filling system has a self-contained 30 gallon storage tank and a 10 hour rechargeable battery. 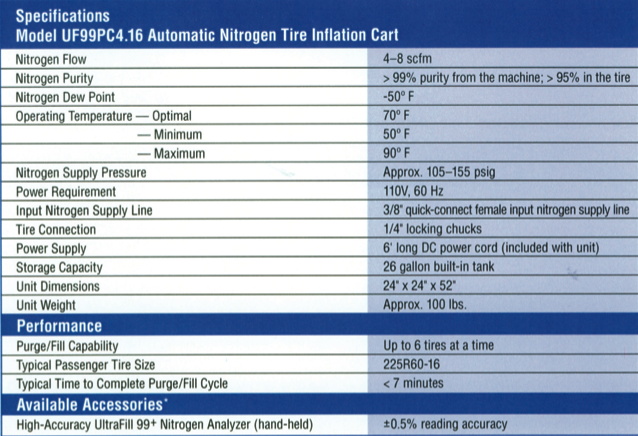 It can be used parking lots or in a shop to purge and fill up to 6 tires simultaneously OR simply top-off previously "nitronized" tires. Its self-contained design sets this Nitrogen Auto-Inflater heads above ALL other similar equipment available today - in versatility, performance and price. It has a digital interface for ease of operation and indicators for cycle completion. Simply The Best!